Looks like the new metropolitan has an impressive resume but can he lead the diocese to numerical growth when the GOA is dying numerically in America? So, he is an EO ethticist. That’s interesting and so…. What does he think of the ethical state of the GOA? He is also a monastic and so…. 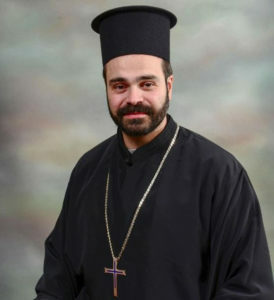 What is his position on elder ephraim, ephraimite fundamentalism and ephraimite priests in the Chicago diocese? What is his position on aerial toll houses and the elders new book on that subject? What will be his relationship with + Gerasimos who is the #1 protector, enabler and supporter of ephraim? It is the truth to say that Greek ethnocentric thinking is not helping the GOA grow in America and so…. Will the Greeks in the GOA ever allow a diocese metropolitan not of Greek ethnicity into that position? If not, why not? It is obvious that the last metropolitan damaged this diocese greatly and so…. Will this new metropolitan acknowledge the damage done and WHY and how it was done and what he is going to do to repair it? In the past I have seen the Orthodox get very excited over a new bishop or metropolitan and so will it be…. Axios! Axios! Axios! Or Caution! Caution! Caution! Axios! Axios! Axios! Or Discernment! Discernment! Discernment! Axios! Axios! Axios! Or Verify before you trust and keep verifying even if you come to trust! The inconvenient truth to the GO in Chicago is simple. No matter what this man proves to be by leadership character and administrative competency if this man cannot turn the numerical dying state of this diocese around to growth in 15 years the diocese will be tiny compared to its size today. As much 75% numerically reduced. If the GOC in America cannot produce church growth by real evangelism outside of its ethnicity and produce and reproduce hierarchy and priest leadership that can lead that growth effort this church is going to continue to die in America. In two years or less the GO will know who this man is by character, leadership and competency. May God’s will be done in the GOA no matter what it takes for that to take place. How much is it going to take ??? Prayers and best wishes for a fruitful Ministry leading the Chicago Metropolis. John’s School of Theology and Seminary, we have ecumenical Midday Prayer. It is a half-hour service based loosely on the ecumenical consensus on the structure of the Liturgy of the Hours, as seen in the reformed Roman office as well as the major Protestant hymnals of recent decades.